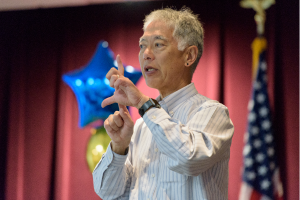 The DE-PBS Project hosted Dr. George Sugai, renowned speaker and co-director of the National Center on PBIS, at our 2015 state-wide conference on October 29, 2015! 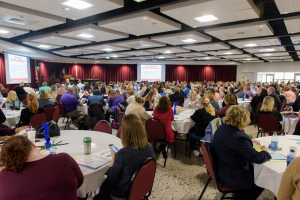 This year’s conference focused on how schools can implement a multi-tiered system of support (MTSS) framework to promote positive school climate and address the needs of students at Tier 1 (schoolwide), Tier 2 (targeted) and Tier 3 (individualized). Additional guest speakers from DE-PBS schools shared their experiences and recommendations for implementing specific elements of a multi-tiered system of support (MTSS) for behavior. It was a full crowd! 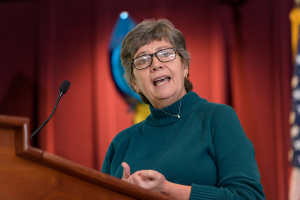 Click here to see photos from the conference. Dr. George Sugai, co-director of the National Center of Positive Behavioral Interventions & Supports and director of University of Connecticut’s Center for Behavioral Education & Research, presented on Multi-Tiered Systems of Support with an emphasis on selecting evidence-based interventions based on needs identified by data. 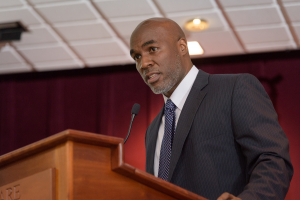 Dorrell Green, assistant superintendent of Brandywine School District, shared the district’s vision for focusing on and improving school climate through his presentation: Excellence Through Equity. A team of staff from Shields Elementary School in the Cape Henlopen School District presented on the process used to infuse Growth Mindset in to their School-wide PBS framework. Click here to see more on how positive behavior support meets growth mindset. A panel of school and community representatives shared an overview of interventions used to support students identified at Tier 2. Brick Mill Elementary School, in partnership with Connecting Generations, presented on their implementation of Character Climb. Brandywine School District presented on implementation of the PEERS curriculum. Dover High School presented on their use of Achievement Mentoring. DE-PBS Project staff along with an educator from Charlton School presented on Prevent-Teach-Reinforce. 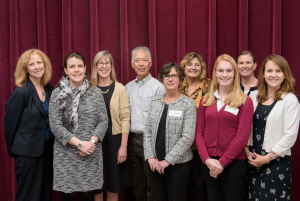 The DE-PBS Project presented on phase recognition achievements as well as results from a longitudinal data study of the Delaware School Climate Survey. For information on the 2013-2014 DE-PBS Conference, please click here.